On October 21, 2000, Steve Baker took this outstanding blacktail with his new PSE Thunderbolt bow. Steve tells us that he hunts with a bow even when everyone else is using a gun. He has been very successful and always has an exciting hunt. This past season was the first in his memory that the rut started in mid-October, which gave hunters an opportunity to see more bucks. He was within bow range of six different bucks and can't say enough about using a quality rangefinder for accurate shots. 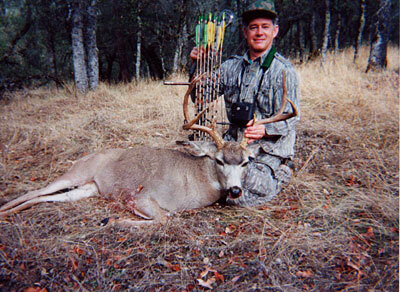 He took his buck at 24 yards while hunting on private property in the Placerville, California area. The 3-point buck was heavy for a blacktail, approximately 122 pounds field dressed, and had 4-inch eye guards.